امشب در مرکز بهایی تورنتو به جلسه دعایی رفتم که به یاد هفت تن از "یاران ایران" برگزار شد. هفت مرد و زنی که اداره امور جامعه بهایی ایران را به عهده دارند. این افراد عبارتند از خانم فریبا کمال آبادی، آقای جمال الدین خانجانی، آقای عفیف نعیمی، آقای سعید رضائی، آقای بهروز توکلی، آقای وحید تیزفهم و خانم مهوش ثابت. برخی از شما آگاهی دارید که یکی از افراد نامبرده در اسفند ۱۳۸۶ (مارس ۲۰۰۸) و شش نفر دیگر در اردیبهشت ۱۳۸۷ (مه ۲۰۰۸) مورد دستگیریهای خودسرانه قرار گرفتند. تا چندی پیش همه بدون هیچ اتهامی در زندان اوین در بازداشت خودسرانه بودند. اما این افراد هفته گذشته مورد اتهاماتی جدی قرار گرفتند از جمله جاسوسی برای اسرائیل، توهین به مقدسات مذهبی و تبلیغ علیه نظام جمهوری اسلامی. درصورتی که این افراد مجرم شناخته شوند برخی از این اتهامات می توانند به مجازات مرگ منجر شوند. فریاد بلند دادخواهی نه تنها از سوی جامعه بهایی بلکه از جامعه بین المللی نسبت به این ظلم و قساوت به گوش رسیده است. مراسم امشب از دو جنبه حائز اهمیت بسیار بود. با وجودیکه برنامه ریزی تمام مراسم طی بیست و چهار ساعت انجام شد اما حضور چشمگیر مردم به نظر من نشاندهنده قدرت و همبستگی جامعه بهایی بود. جو مراسم جوی مثبت بود با تمرکز بر امید، دعا و مناجات و انرژی مثبت. بسیاری از ما از جمله خود من چنان از موارد نقض حقوق بشر در ایران انتقاد می کنیم که فراموش می کنیم تغییر همچنین به امید، انرژی مثبت و باور به اینکه تغییر امکان پذیر است و در حال وقوع نیاز دارد. امیدوارم شاهد برگزاری بیشتر مراسمی از این دست باشیم. نه فقط در جامعه بهایی بلکه در سراسر جامعه ایرانی. در همبستگی، نیرویی نهفته است و در آن نیرو، امید فراوان برای تغییر. با اعلام همبستگی با هفت تن از "یاران ایران" و تمام زندانیان سیاسی و خانواده هایشان. Student Council of Defense of Human Rights in Kurdistan: Mr. Yaser Goli’s 15 year jail sentence as well as the sentence of exile to Baft Prison was upheld by the Court of Appeal in the province of Kurdistan on February 17th 2009. The sentence was upheld 17 months after Mr. Goli’s arrest. He started serving his sentence on February 18th 2009. In an interview with the Student Council of Defense of Human Rights in Kurdistan, Mr. Goli’s lawyer Mr. Nemat Ahmadi has stated: The Judgment I received was 10 sentences long and thre is no indication that there was any evidence to prove Mr. Golis’ Guilt. Further Mr. Goli has never confessed to committing any of the offences he is being charged with during interrogation. Yaser Goli is an Economic Development graduate from Azad University in Sanandaj. 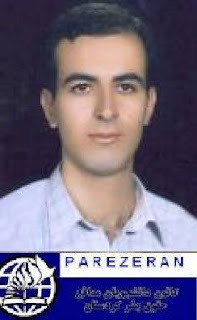 He was arrested on 17 October 2007, in front of Azad University in Sanandaj. Following his arrest, intelligence forces went to his home and after searching it took his computer case and private diary with them. After his arrest for days there was no news about his whereabouts and his family was extremely concerned especially due to the fact that Mr. Goli suffers from a heart condition. Mr. Goli’s brother has stated that his father was also imprisoned for 6 days for following up on his son’s case. His mother Ms. Fatemeh Goftari has also been arrested on numerous occasions, she is a human rights activist and a member of Azarmehr Association of Women of Kurdistan. Student Council of Defense of Human Rights in Kurdistan: Although there has been an international outcry against the death sentence of student activist Habibollah Lotfi, his death sentence has been upheld by the Court of Appeal in the province of Kurdistan. Mr. Lotfi’s death sentence was upheld by the Court of Appeal on January 29th 2009. He was made aware of the decision on February 17th 2009. The Court of Appeal upheld Mr. Lotfi’s death sentence even though there was a great amount of evidence proving that any confessions Mr. Lotfi may have made were made under severe and brutal torture. Mr. Habibollah Lotfi, a 27 year old engineering student in the University of Eylam was arrested on October 23rd 2007 in the City of Sanandaj. After searching for him for nine (9) days in hospitals and detention centres, one of his family members was able to locate him in the “Tamin Ejtemai” Hospital in Sanandaj. At that time it became apparent that because of severe torture he had had suffered from internal bleeding in his kidneys and had to be transferred to a hospital outside of the Ministry of Intelligence Detention Centre. After the completion of his medical treatment, once again Mr. Lotfi was transferred to the detention Centre of the Ministry of Intelligence in the city of Sanandaj. Later on through visits with family it became apparent that Mr. Lotfi has suffered from broken bones in four (4) different locations on his head, and had at least two major cuts on his face. Also during one torture session his lower lip had been completely ripped off. He was also tortured in front of other prisoners in order to scare them into making confessions. Mr. Lotfi suffered from a second internal bleeding of his kidneys due to further torture he was subjected to. He further suffers from Bronchitis, which became worse due to the lack of proper medical treatment. In further visitations with family members it became apparent that due to being hung upside down for hours at a time he suffered from serious damage to the veins in his eyes and nose. Because of this he continuously suffers from internal bleeding in his eyes and nose. Mr. Habibollah Lotfi is a social activist in the city of Sanandaj. He worked with numerous social activists organizations such as “Chiya” “Shahve” and “Jiyaneveh” in the city of Sanadaj. The Student Council of Defense of Human Rights in Kurdistan is extremely concerned about the decision of the Court of Appeal to uphold Mr. Lotfi’s death sentence. The Student Council of Defence of Human Rights considers it its duty to use all its resources to help save the life of Mr. Lotfi. As well we invite all human rights organizations and all freedom loving people to show solidarity with Mr. Lotfi and help save his life. Tonight I attended a prayer event at the Toronto Baha’i Centre in Honour of the “Seven Friends of Iran” (Seven men and women who manage the affairs of the Baha’i Community in Iran. These individuals are Mrs. Fariba Kamalabadi, Mr. Jamoladdin Khanjani, Mr. Afif Naeimi, Mr. Saeed Rezayi, Mr. Behrouz Tavakkoli, Mr. Vahid Tizfahms and Mrs. Mahvash Sabet. As many of the readers may be aware one of the individuals named above was arbitrarily arrested in March of 2008 and the remaining six in May of 2008. Up until recently all were being held arbitrarily and without any charges in the Evin Prison, however last week they were charged with some very serious charges including espionage for Israel, insulting religious sanctities and propaganda against the Islamic Republic. If convicted some of these charges may lead to the death penalty. There has been a great public outcry about this atrocity, not only from the Baha’i Community, but internationally. Tonight’s event had two very remarkable aspects. 1. Even though the entire event was organized within 24 hours, there was great turn out which I believe shows the strength and the solidarity of the Baha’i Community. 2. It was an extremely positive event focusing on hope, prayer and positive energy. Many of us (I am also guilty of this) are so focused on pointing out the human rights violations which occur in Iran, that we forget that change also requires hope, positive energy and the belief that change is possible and that it’s on its way. I hope to see many more similar events, not only within teh Baha’i Community, but the entire Iranian community. In solidarity there is strength and in that strength there is great hope for change. In solidarity with the “Seven Friends of Iran” as well as all other political prisoners and their families.